Re-structuring schools in Haiti is an issue that would appear a bit vague to be discussed because the Domain of schools in Haiti has so many problems and I believe if we, educators, Haitian researchers who are living in Diaspora do not think seriously about that, Haitian education can collapse in the 21st century. In the first category, it is impossible for us to talk about the government, the most important ingredient in the issue and the one who has power to do everything. Here, we can first take a look at the 1987 Constitution as a guide (what it says about education) and from there, we can question the responsibility of the government (is he working in the respect of the constitution in order to guarantee a free education for everybody?). But within the same question, we must not rush to blame the current government without going back in history to see what other governments left behind and at the same time go back to the present to take a look at the parliament, who in majority is not doing anything serious; they are more interested in boycotting the bills that the executive branch would propose in the developing process of Haiti (if we are looking at their behavior for more than a year, blocking the government completely). In the second category, School monopoly, the first question to be asked before opening discussion would be: who has the school monopoly in Haiti (the government or the private sector)? That's an easy question to answer when we know that most schools in Haiti are private. Within the same “private classification”, we have the “lekòl bòlèt”, private colleges (1), and the religious colleges. For the ‘lekòl bòlèt', they are a series of schools where you'll find an unqualified person heading them. It's a quick business to open a school in Haiti to make money and once the individual has connection and some money, that won't take long to rent a place, close it with some NAS and put a sign that says “private college of so and so”. Within the same private classification, more or less, there are some teachers who do have a pedagogical formation who can found a school where more or less you'll find some qualified teachers who are teaching there. For the religious schools (protestants or catholic), they seem to be more organized and if we go in the history of schools in Haiti, from “Le Concordat de 1860” (2), we can notice the dominance of the catholic schools from that time to the end of this century. The government knows their existence and the same people who work for the government think they would offer the best education; so, many times that's where their children go to school. It is true they have a sort of organization, they develop their own teaching materials, but the question we may ask is: what percentage of the Haitian students population who can benefit from these schools? To answer this question, we fall into the economic aspect where most children in Haiti don't have access to receive an education in these religious schools because they cost money. But whether it's students who attend the ‘lekòl bòlèt', the private schools, the religious schools, they use the teaching materials developed by religious schools (e.g., when looking at most of teaching materials that F.I.C (3) has developed or published). We can look at that as a monopoly also in the process of developing teaching materials for schools. Here, there are some parentheses for critics to open. In the third category, teachers, what can we say? The answer is: many things! The first question we may ask is: what sort of preparation (formation) do they have? To answer this question, we can analyze all the levels (elementary /middle, secondary, superior). Most teachers don't receive a pedagogical preparation before going into the classroom (in this phase, we can include those at elementary /middle and secondary which are more important in the big educational nursery before attacking the superior level). Here again, we must not rush to blame them but rather the laws and the government. Nothing serious can be accomplished without a series of laws that are established. If we'd decide to do a research to check how many teachers at the secondary level who don't even have a high school diploma, not to even mention a bachelor's degree (four years of studies) and then to recommend them to go back to school, all the schools in Haiti (elementary, middle, secondary levels would be closed the same day). But if ever a real reform in Haiti would take place, they would have to review the teachers' credentials where they would have to go back to school anyhow. Again, for that to be done, we end up in the legal aspect where it should have been mandatory before a teacher start teaching at the secondary level to have a bachelor's degree and then to attend a series of pedagogical seminars. And to teach at elementary /middle school level, a teacher should have his high school diploma and then to attend a series of pedagogical seminars. But again, the question we may ask is: who has the school monopoly in Haiti (the government or the private sector)? That is, in order to succeed in taking a series of measure that would better the system of education in Haiti, there would have to have a series of laws to be respected and it's the Haitian government who has the power to accelerate that. These propositions should have been submitted to the parliament in order to have a majority vote on them. But the question is: what parliament? What preparation do these congressmen have? Do they really care about the problem of education in Haiti or are they at a level to understand the in and out of this problem. It's all a bunch of questions that need to be reflected upon with many strategies and alternatives for a Haitian who conscious of the problem (how, by what means he can go through to help?). So roughly, it's a problem that should have concerned Haitians in Haiti as well as those in Diaspora. Some alternatives to try to solve part of this complex problem would be: organizing or re-organizing the communities (cities, town) where these communities' leaders would have to sit together to analyze the school problem in the areas and what they could do as community. Here, we fall into the philosophy “filozofi grès kochon an kwit kochon an”. In this philosophy, first we can have the absence of the government (in a sense) where it's the community who is rethinking in order to re-structure itself, to provide for itself what it needs without the government funds for this purpose. On the other hand, we can't ignore the government either. Why? Whatever what's going on in the community, the authorities representing the government in the areas should be invited; their presence should be noticed even if they figure-head but deep in the hear, they know that they have a certain authority somehow. Here, we focus on the mayors of the cities or towns. They must be there; they must know about the projects and they must be approached with wisdom in order to encourage DEMACH. And further down the road (if possible), the government can contribute because it's a way to alleviate the problem for the government; so the government must appreciate the developmental works in the process at the community level because they, themselves, have too many loads on their shoulder to do everything at the same time. In the last category, we se the students. That reminds me of the babies, the innocent ones right away. Whatever what you give a child, he will put it in his mouth anyhow. Then here, there's a certain parallel between students and children; that is: the group at the top of the hierarchy is responsible for the children's education. Notice that I don't include parents and some critics can say: parents should have included in these categories. Yes, parents are understood here but I want to focus more on the category that should have been more responsible. Parents always play an important role in the children's education in Haiti. There are children's mothers that sell grilled peanuts, who walk with sandals but what say that they are working hard so that their kids become doctors and these dreams, many times, become a reality. There are fathers who are snow cone vendors but who share the shame dream and many other parents who did not have the chance to attend school, who are at the same socio-economic ladder but, who have a vision for their children to get far in school. So, we must congratulate many Haitian parents who think in this way because education is a luxury in Haiti. One thing that has touched me a lot, not long ago, was when I was reading the autobiography of Manno Sanon (popular Haitian soccer player) who is talking about his mother, what she did to help him; it's a story that makes tears come out of one's eyes. So, parents are very important in the education of the children, whatever the social class they may belong to. And it's important for schools in Haiti to emphasize on parent's appreciation where when kids receive their report cards there would be open-house (where the students' parents would be present to meet the teachers and to know about their child's progress in the schools). 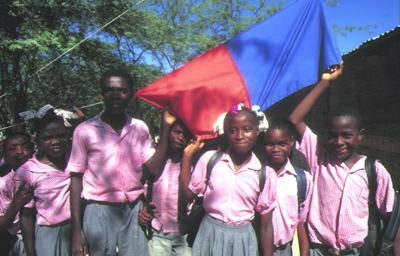 How can students help in the development of Haiti? That's one of the great errors that the Haitian government could have committed when neglecting this aspect. Don't forget that student are nurseries representing a country's future in all sense. They must be engaged at an early age in a series of works for the welfare of Haiti and there are special ways in which that can be done. It would be good for the government make it mandatory for the students at the “baccalaureate” level to spend a year in the countryside doing some community works somehow (e.g., building a state school, a hospital, participating in literacy campaign, in a project somehow that the government would have that is functioning in the advantage of the community. Here, the government would be in charge to be responsible for these students during their working period (that is, give them some money, be responsible for their room and board also) and then that would guarantee them when applying for a job, but all these would be governed by laws. So, globally speaking, we can lay out many points that would touch what is in relation with the development of Haiti and particularly, the education sector we are focusing on; it would have to be governed by laws so that the government would make the basic necessary changes (if he succeed in controlling this monopoly) and maybe in our good understanding as critics, observers or conscious Haitians, we can think of other alternatives when the government's car is broken down or when the government does not do his job any longer. (E. W. Védrine). Védrine, I've read with enthusiasm your text you wrote on ‘re-structuring schools in Haiti'. I congratulate you for this reflection. Education is the pillar of a country's development. It's the base of the development of the country that you raise here. I see many beautiful ideas in your text, but I don't see that you pose the problem of education in a well-defined way. What I mean is: what education? For what country? With what development? There must be a clear choice of development in order to be able to know what type of education you are going to give to the population and what strategy you are going to put in place in order to attend the objectives that you've laid out. I would also say that, first, we ought to be clear on a first choice: literacy or education? or both? Will our means allow us to do both? If it were for me, I would choose education as priority in order to me to dry up the spring furnishing the illiterates. I would also say: what school? in what language? I would have the tendency to choose a republican school where all children would share the same values. But I would say one school for everyone. Many people believe it would be in the Creole language to educate the Haitian people. They say that their mother's language is easier to understand what the teacher is teaching. I don't agree with this approach. In many countries where they speak Creole French or Creole and English, they succeed in educating most people, if not all, in French or English. I am referring to the other islands around us and some African countries. In the African countries, you may say that it's more complicated because there are times when they speak some 20 different dialects within the same country. They, anyhow, succeed in doing that. I could cite Senegal for instance. This point of view, people would have the tendency to say it's one that is elitist, but I believe it's not true. We could debate it for hours and hours. I also believe that we would ought to have an education that would allow us to be more open on the world. I don't agree with any DEMAGOJI. We can make some little teaching materials in Creole but we do not have the means to have access to all scientific and technical ones in the Creole language. Our country's economy does not allow us. Even if we would put together the whole country's economy that speaks Creole, we would not be able to attend this objective. We are already isolated in Haiti with the French language because all of our surroundings speak Spanish and English. It does not matter that we speak them also. But the goat says what's in your belly is yours. Let's start with the language that history left us and that can give us more opening on the world. This question may lead us to others. For example, the issue related to teachers. We most say without DEMAGOJI, we don't have real teachers anymore in Haiti. We would have to prepare many others while have others coming from other places such as Guadalupe, Martinique, Guyana, France, Canada, Senegal etc… No doubt about it. There can not be DEMAGOJI in this fundamental issue. Canada has done that; many African countries have done it. We, Haitians, have helped many others in this sense. I am not going to go on with the debate today. I believe I have said a lot already but I don't pretend to say everything. I believe I say things that can shock people and that can raise many discussions. I prefer waiting for some reactions before I go on with the debate. I am not a teacher, but I do know that this issue is one that is fundamental. If we take it the wrong way, we will not get anywhere.